New Zealand entertainer Rick Sahar has been awarded the country’s 2011 “Top Variety Artist” award. 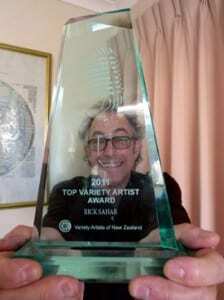 This prestigious award is in recognition for Rick Sahar’s entertainment talent – and for the many shows he has performed in various venues throughout New Zealand and as a variety of Rick’s comic characters and themes. As this award is decided by his peers in the entertainment industry, Rick feels humbled and honoured to be this year’s recipient and for the recognition that accompanies it. “I know I am good, but I did not know I am this good!”, Rick jokingly says. “To be appreciated for work I really enjoy doing is great and affirming of the effort and thought I put into being an entertainer, to honour the audience”. Sahar is American-born, and has lived in New Zealand for 30 years where he has been a professional entertainer for 27 years. He has also performed shows in Australia, Hong Kong, Papua New Guinea and Israel, from kindergartens through to exclusive country clubs. Sahar told J-Wire: “I see myself as a tradesman simply doing a job that I am asked to do, much like a good plumber would, that leaves people happy”. The popular entertainer is also an active member of Temple Sinai in Wellington at which he a member of the lay-chazzan team and the Rituals Committee. Photo of me with the award taken by my good friend, Raoul Ketko, thank you Raoul!